Missing – Private Noel Hunt, Thetford Road, has been announced as missing whilst serving in the Middle East. He joined the Army at the age of 18 and had just completed nine years service, and during this time he had served in Palestine and Malta during the island’s heavy bombardment by the Germans. P.O.W. – Mr H Croxhall, 12 Crown Street, has received a standard printed letter form her husband, Private H Croxhall, saying that he is in a P.O.W. camp in Thailand, but he is said to be in good health. P.O.W. – Flight Sergeant Ronald B Mutum, son of Mr and Mrs B Mutum, 98 Bury Road, who was reported as missing is now officially notified as being safe and well in a P.O.W. camp in German hands. He had spent Christmas 1942 in Spain where he was interned following a forced landing but was then repatriated in early 1943. Petty sessions – Mr B.C. Culey was brought before the Brandon magistrates on a charge of wilfully obstructing the free passage of a footpath by causing a crowd to assemble outside the cinema. Mr and Mrs Kent, of the nearby Flowerpot public house, said their entrance was interfered with by the queues and Mr Culey had already been warned on a previous occasion when the Military Police had come to the cinema to marshal the crowd. Mr Culey said he had offered to pay for a Police Constable to be on duty at the cinema, but had to put his employees in charge of the queues. Mr Culey assured the magistrates that he was doing everything in his power but the queues could not form around the cinema, because they would block the emergency exits. Petty sessions – Herbert Kent, innkeeper of the Flowerpot Inn, was up before the magistrates for failing to comply with a National Service Order, which requested that he enrol in the Air Raid Precautions. The Bench heard that on 24th September 1940 Mr Kent had appealed the Order but this was dismissed. Then on 1st December 1943 he had been instructed to become a part-time Civil Defence Air Raid Warden at the Flintknappers Hotel. At the time he blamed ill health for not attending because he had sore feet, fallen arches and swollen ankles. On 15th December 1943 he again failed to enrol when requested. Mr Kent told the Bench that he and his father had kept the Flowerpot Inn for 95 years without a single complaint. He had served in France during the Great War, where he had been wounded and gassed, and now aged 58 years old he was willing to do whatever he could for the Civil Defence, but only within his ability. M.R.D.C. – The Mildenhall Rural District Council decided to support the country wide campaign to bring to notice of those concealed the serious risks involved by contracting Venereal Disease. It was agreed to also ask the Police to visit public houses in the area to ensure that the regulation with regards to supplying alcoholic drinks to young persons under age is observed. Brandon scouts – The dedication of the colours of the 1st Brandon Scout Troop took place at the St Peter’s Church on a Sunday. 140 youths attended including those from Brandon Scouts, Girl Guides, Army Cadet Force, Girls’ Training Corps and 2052 Squadron A.T.C. Brandon man’s death – Mr William Edward Wells, of Town Street, has died in a tragic accident. Floral tributes from the town’s Home Guard, his comrades in the Medical Section and “all at the White Horse”. Brandon woman’s death – Mr and Mrs R Rumsey, of 26 Coronation Place, Brandon, have announced that their 20 year old daughter, Miss Rose Rumsey, has sadly died. Charity bread – The annual distribution of charity bread took place in the Church School and one hundred and thirty seven 2lb loaves were given away. Petty sessions – On June 5th Sgt Donald Gardiner of the Royal Canadian Air Force, pleaded not guilty to attempting to take and drive away a motor vehicle without the owner’s consent in Brandon. The offence was reported to have occurred at 11.30pm on May 20th, when PC Johnson noticed two airmen standing near to the entrance of Calders Wood Yard. He had watched them for a minute or so and then heard someone from within the yard whistle a signal to the men after which one of the men went into the yard. PC Johnson then heard someone trying to start up an engine at which point he turned on his torch and saw two men standing at the front of Messrs. Calders Ltd lorry. The two men ran off but the PC apprehended Gardiner who was sat in the driver’s seat of the lorry. The inspection plate over the engine had been removed and the starting crank handle was in the front of the engine. Gardiner was unwilling to identify the other men to the Police and denied that he was drunk, although he did admit to smelling of alcohol. An employee of Messrs. Calders Ltd, Mr. Ronald Dickerson, said that he had parked the lorry in the wood yard and had immobilised it by taking out the rotor arm, closing the cabin windows and locking the doors. When he was shown the lorry afterwards by the police he said that the door had been forced and that the engine had been tampered with. Gardiner told the Brandon Police Court that he and his mates had been celebrating in Brandon and had got a bit too happy and they then tried to get a lift back to their billets but could not get one and so started to ‘play about’ with the lorry. He had done nothing other than merely sit in the driver’s seat and had no intention of stealing the lorry. The Brandon Police Court fined him £2. Florence May Baker, a saw-mill worker, was fined £1 for riding a cycle without lights. Royal British Legion – At the General Meeting of the Brandon Royal British Legion, chaired by General de Lotbiniere, it was agreed to give £10 to Mr L Farrow, who is leaving the town, as appreciation of his work for the club. The club also donated £50 to a fund for local men and women who are serving in the forces and £5 to the (Suffolk) British Red Cross. A bank manager, Mr Cook, was invited onto the Finance Committee and also as an auditor. Soldier in court – William Davies, a soldier, appeared before Mr H Wentworth-Smith at an occasional court after he was caught attempting to break into the Avenue Cinema. He was handed over to the military authorities to deal with him. P.O.W. – Mrs M Ridgeon, 16 George Street, has recently received the first news of her son, Private R Ridgeon. He has written to say that he is in a Prisoner Of War camp in Thailand and is in excellent health and working for pay. Cushion sold for charity – A cushion made by Mrs D Copping, London Road, realised £7 for the Prisoners Of War Fund. P.O.W. – Mr and Mrs R Royal, 155 Thetford Road, have received a card from their son, Private F Royal, Cambridgeshire Regiment, who is currently a prisoner in Thailand. This is their first news of their son who is well known locally, especially through the local football club, as “Gunny” Royal. House auction – Mr F.W. Gentle bought three cottages from an auction held at the Ram Hotel at 7p.m. on 20th July. 26, 28 and 30 London Road were bought for £825, and the tenants of these properties are Mrs Fairhead, Mr G Edwards and Miss F Ashley. K.I.A. – In July a Service was held for a Brandon man, Private Horace Augustus Stannard, who was killed in action in the Mediterranean. The Service was held at the Methodist Church on London Road, Brandon, and the Rev A.J. Wiffen and Mr W.H. Thoday, a L.C.C. Schoolmaster, formerly of Brandon, paid tributes. His widow and other relatives attended the Service. This makes a total for the M.R.D.C. region = £114,101 8s 7d. Death of Mr Wood – The death of Mr W.B. Wood aged 62, of London Road, Brandon, has been announced. Before his illness Mr Wood was a Major in the local Home Guard and a member of the Brandon Royal British Legion. In 1942 Major Wood took over from Major Wentworth-Smith as Commanding Officer of ‘F’ (Brandon) Company, when Wentworth-Smith retired. His funeral was attended by members of the 8th Battalion Norfolk Home Guard, Cambridgeshire and Suffolk Home Guard, Boy Scouts, Calder Ltd., Fisons Ltd., the Police, Eastern Area Royal British Legion, Brandon Royal British Legion. Town Street, Serving Soldiers Fund – The Town Street ‘Serving Soldiers’ Fund was boosted during the ‘Salute the Soldier Week, by £130 5s and 15s of saving certificates would go to all 77 Brandon men serving in the Forces. This included all soldiers, sailors, airmen, A.T.S. and W.A.A.F. This leaves a balance in the fund of £76 5s to be used to send cigarettes and parcels to the POWs where it is possible. 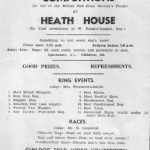 Fund raising – A garden fete held at Heath House, by kind permission of Mr and Mrs Rought-Rought and organised by Miss W Neep, in aid of the Suffolk Prisoners Of War Fund, was attended by over 2,000 and raised £420. Letter from the front – Captain G.N. Shann, has written to his father, Dr E.W. Shann, of the Paddocks, Brandon, stating that he likes his posting in East Africa so much that he wishes to stay on and apply for employment in Tanganyika Territory. Before the war he studied historical research at Cambridge University and hopes to be in education or administration in the territory. P.O.W. returns home – Private C Dixon, Essex Regiment, has arrived at his mother’s home in Brandon after being a Prisoner Of War at the hands of the Germans. He was repatriated in Italy and is now in Mile End, Brandon, the home of his parents, Mrs and the late Mr A Dixon. Brandon brothers meet in Italy – Mr. and Mrs. W. Arnold, 13 Coronation Place, Brandon, received news that two of their sons, Private W. Arnold, R.A.M.C. and Private J. Arnold, R.A.S.C. had met in Italy. They were reported as both being in good health and had just spent seven days’ leave together. They were both keen sportsmen and were members of the local cricket and football clubs. P.O.W. – Mrs Branch, 139 Thetford Road, has received a card from her husband, Sergeant Branch, who is a Prisoner Of War in a camp in Taiwan. The card states that he is fit and well. G.I. wedding – Miss Betty Victoria Dartford, 21 Coronation Place, Brandon, has married and American Private, James Henry Lee, of Pomeroy, Ohio, at St Peter’s Church. West Suffolk bombing casualties – Details have been released of the bombing casualties for West Suffolk. So far 43 people have been killed and 130 injured in 178 raids. There were 1,852 High Explosive bombs dropped, along with 13,624 incendiaries. It has also been confirmed that on January 30th, 1941, at the Chicory Factory, near Lakenheath, High Explosive bombs were dropped and the enemy aircraft strafed the area with machine gun fire that damaged the factory. A lorry driver’s mate, 40-year-old Jack Talbot, received a machine gun bullet just below the heart and died instantly and William J Greenacre was wounded in the knee by machine gun fire from the same plane. Medal awarded – It has been reported that Private-Sergeant Halls, Royal Army Medical Corps, has been awarded the Military Medal. Christmas gift fund – The Christmas Gift Fund for local men and women serving in the Forces has raised £620. 310 personnel will receive Christmas cards, but it was not easy to distinguish the ‘real’ Brandonians but 35s will be credited to them at Barclays Bank. The card depicts a scene of Brandon Bridge. Petty session – A Brandon farmer, Mr John Fendick, was fiend £5 for selling milk not of the nature, substance and quality demanded. Despite pleading not guilty and good character witness statements from his family his milk was tested and proved that it had been diluted with water by up to 20%. Doug Philips, plant driver, of Truro, was fined a total of £2 10s and 10s costs for poaching two rabbits. Poppy Appeal – Brandon, Santon Downham and Wangford raised a total of £133 for the 1944 Poppy Day Appeal. Soldier awarded medal – Driver Allan Butcher, R.A.S.C., serving in the Central Mediterranean Forces has been awarded the Order of St. Mark and also a Greek medal. He is the son of Mr and Mrs J.W. Butcher, of London Road. Accident in Brandon – On September 22nd 1943, 16-year-old Ivy Dixon lost her hand in an accident at a Brandon fur factory. She had attempted to remove ‘flue’ that was coming from the machine and to do this she removed the cover at the back of the machine and put her hand in. The knives in the machine pulled her hand in and cut it off. Messrs S & P Lingwood, of London Road, were found to be negligent at a later magistrates’ hearing. D.F.C. awarded to Brandon man – Acting Squadron Leader W.L. Johnson, R.A.F.V.R., aged 25, is now a double Distinguished Flying Cross. He joined up at the start of the war and earned his first D.F.C. in January 1943. Promotion – Lance Bombardier L.T. Mutum, Royal Artillery, of 6 Coronation Place, has been appointed Press Assistant to the Public Relations Officer of his unit in Europe. Before the war he was a clerk/assistant to Mr R.J. Woodrow, Brandon ironmonger and at the outbreak of war he wrote for the Bury Free Press. He has edited a regimental magazine called “Suffolk Punch” which he founded in 1942. Mr A.E. Chapman (Clerk) said that nothing had been heard yet about the de-requisitioning of a building for use as a public building. Mr B Lingwood said there was a request for immediate attention to the poor state of the road near Park View and Sandgalls. Mr F.W. Gentle drew the Council’s attention to the constant defacing of a copy of the byelaws that had been placed in the Avenue. The byelaws had prohibited cycling along that path and the Police had been asked to intervene. Mr F Mount requested for an electric light to be placed to cover the Market Hill car park and that the town clock be illuminated again. Mr T Green said that the Council should approach the gas company to install lamps as soon as possible for use when the light restrictions are lifted. The issue of removing rotten posts and barded wire from The Avenue was raised by Mr Brearley. Christmas 1944 – Nine Carols were sung and lessons were read at The Baptist Church on Christmas Eve. There was also singing by the choir and Rev. Denis H. Bareham was the preacher. Mrs A.J. Wiffen and Rev. G. Kirkpatrick welcomed the children’s’ mothers to the Infants School Carol Service and Rev. Kirkpatrick gave a talk to the children. The staff had decorated the school, the mothers gave the children a Christmas party and a play was acted out by some of the children under the instruction of Miss Dawn. Afterwards 60 children enjoyed tea and games. On Christmas Day some of the Brandon schoolchildren were the guests of the U.S.A.A.F. at a party.